Commercial contractors know that efficiency is a factor of everything on the jobsite, which is why it’s important to keep systems working well and budgets on track. When systems are efficient and uptime is maximized, every project can lead to success. Trust Rheem®—the world’s only provider of complete air, water, refrigeration and integrated solutions—to help get you there. Fill out the short form below to have a representative contact you. Let our experts show you how our air and water solutions can make your next job or project more efficient. Intelligent Hot Water. Smart Business. Through our partnership with Fernwood Capital & Leasing, Commercial KwikComfort® Financing makes it easy for you to offer financing to your customers. Retail stores require durable, dependable and efficient heating, cooling, water heating and refrigeration equipment. That’s why we engineer innovative products whose effects can be felt from the front check out to the back offices—and in your profits. Quickly specify, select and document all of your Rheem equipment with our RapidSpec™ tool. 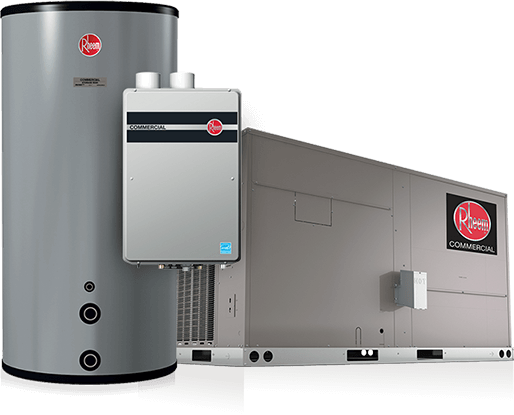 Speak to a Rheem restaurant specialist about adding Rheem heating, cooling and hot water solutions for your restaurant’s menu. 1Source: Energy Information Administration, Office of Energy Markets and End Use, Forms EIA-871A, C, and E of the 2003 Commercial Buildings Energy Consumption Survey. 2Source: Water Heater Downtime Survey Analysis, presented by Hanover Research in partnership with Rheem, August 20173Source:https://www.environmentalleader.com/2016/07/hotel-water-use-are-you-flushing-money-down-the-drain/ 4Source: Energy Information Administration, Office of Energy Markets and End Use, Forms EIA-871A, C, and E of the 2003 Commercial Buildings Energy Consumption Survey.